Allegory: A fictional symbolic representation of truths about human existence. Analogy: A resemblance in some particulars between things otherwise unlike. Conceit: a. fanciful idea b. an elaborate or strained metaphor. Figurative: expressing one thing in terms normally denoting another with which it may be regarded as analogous. Literal: b. adhering to fact or to the ordinary construction or primary meaning of a term or expression: ACTUAL c. free from exaggeration or embellishment d. characterized by a concern mainly for facts. 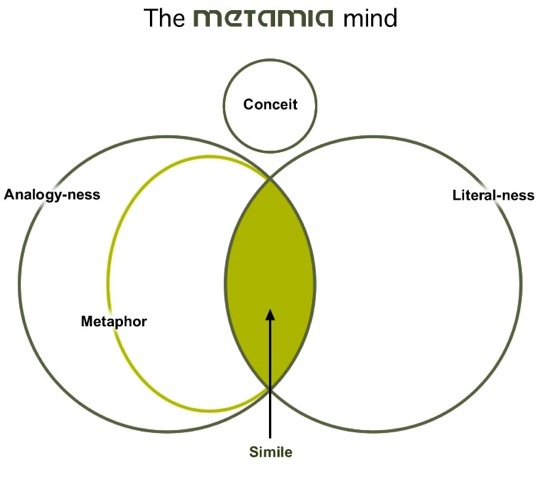 Metaphor: a figure of speech in which a word or phrase literally denotes one kind of object or idea is used in place of another to suggest a likeness or analogy between them (as in drowning in money): broadly, figurative language, compare simile. Simile: A figure of speech comparing two unlike things that is often introduced by like or as (cheeks like roses). A metaphor is a type of speech or writing. A metaphor is an indirect comparison between two disparate things. A simile is a pointed, direct and explicit metaphor that makes a comparison between two disparate things. In essence, a simile is a literal declaration of a non-literal relationship between two concepts, entities or domains. A conceit is a type of metaphor that is unrealistic. Figurative is an adjective that describes parts of speech or the written word. Metaphorical writing is a category of writing and it is synonymous with figurative writing. Poetry, typically, is highly metaphorical writing. In contrast, legal briefs are logical, literal and to the point. Analogy is a broader term that encompasses the written word, mathematics and symbolic logic. 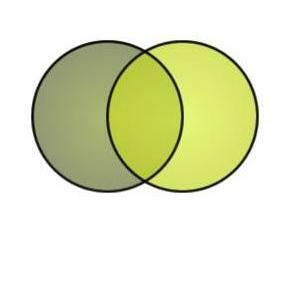 "Analogy" is a cognitive process that links two disparate entities by common particulars. It can be written, verbal, mathematical (A/B=C/D) or perhaps a style of thinking. One possible phrasing is that a metaphor is implicit analogy and a simile is explicit analogy. "We use this third term[analogy], besides simile and metaphor, for a comparison that makes or illustrates a point, and usually takes longer to say than a metaphor or simile. An analogy can be extended into a whole essay; minsters' sermons are sometime analogies-life is like the hundred-yard dash; birth is the starting gun, the tape is death, God is the judge. A whole book, or system of thought, can be based on analogy. Oswald Spengler, in The Decline of the West, at the beginning states an analogy, that a civilization is an organism, is born, grows old, and dies; then he writes a long book to make a factual case for his analogy."